TRENTON TFL - Large Direct Drive Fluid Coolers | M. J. Mac Inc.
• Narrow width design to suit shipment in containers. • Standard 850 RPM quiet low speed dual voltage (230/460) fan motors with male electrical plug, moisture slinger, and rainshield for complete weather protection. 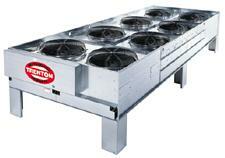 • All fan sections individually baffled with full height partitions, and clean-out panels. • Complete selection of electrical fan cycling and speed control options. • Heavy-gauge galvanized steel cabinet construction assembled with zinc plated huck bolts supported on heavy-duty legs. • Control circuit transformer where applicable motor mounts / support.